If you came to this post as a runner, and not as a genealogist, you can find out more about my Boston Qualifying journey here. This past weekend was a pretty eventful one for our family. On Saturday, I ran the St. George Marathon in Southern Utah and qualified for the 2017 Boston Marathon. Qualifying for Boston has been a dream of mine for a long time and something I’ve earnestly and ceaselessly worked towards for the past 5 years. I began running marathons 10 years ago, but not until I broke the 4 hour mark in did I even let myself consider the possibility of running fast enough to BQ. Though constantly doubting whether it would ever happen, I nonetheless committed myself to getting as fast as I possible could. I have battled injury and come back from an unexpected c-section, but thanks to the opportunity to train and race in Utah, and the unending support of my husband, I am thrilled to have met this goal on my 21st marathon. To me, the Boston Marathon symbolizes the marriage of two of my passions: running and history. Boston is the oldest consecutive marathon to date, in one of the United State’s most historic cities. It takes place on Patriot’s Day, a local holiday commemorating the beginning of the Revolutionary War. From the screaming Wellesley students at mile 13 to “Heartbreak Hill” near mile 21, the race is steeped in tradition. 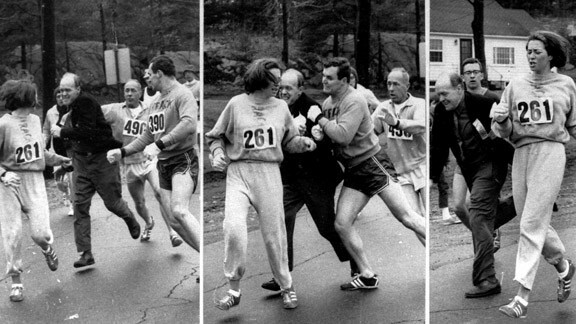 It is difficult to comprehend that in 1967 — just 15 years before I was born — race officials tried to physical prevent Boston’s first female finisher Katherine Switzer from completing the race. And today, not just anyone can run the marathon. For all but the most gifted, it takes work to qualify for Boston . It’s funny. I used to hate running. I remember begging my high school volleyball coach to excuse us from running laps. Then, I left for college and wanted to join the fledgling women’s soccer program there. Not only was I the worst player at tryouts my freshman year, I was also the worst runner. Thankfully, running doesn’t require much coordination – just enough determination to get better at it. So that’s what I set out to do, and somewhere along the way I began to fall in love with it. Now, I am basically addicted. Running is as much a part of my life as anything. I am not a genetically gifted runner. Most people who commit themselves to qualifying for Boston do so long before their 21st marathon. But who knows? Maybe there is something passed down from an ancestor that accounts for my tenacity at it. Thanks to genealogy, I have more than just an inkling that this might be the case. 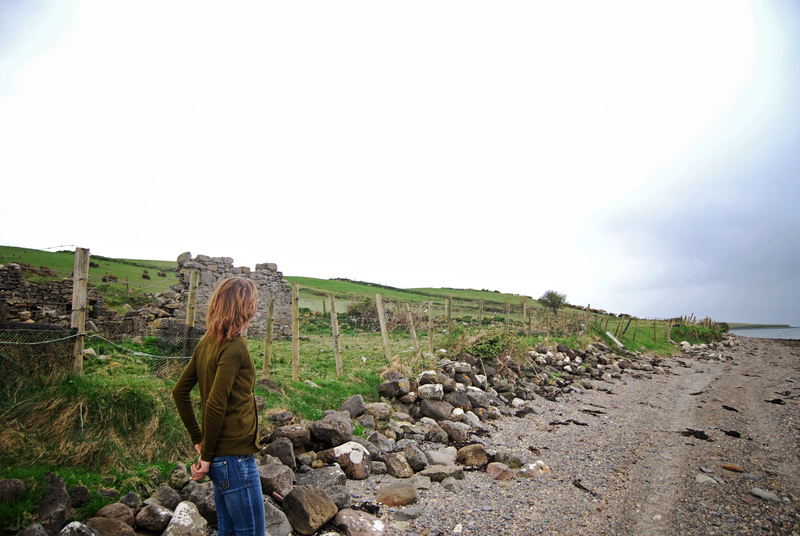 In 2012, my husband and I traveled to Ireland and visited the ancestral homes of my Irish great-grandmother and great-grandfather. 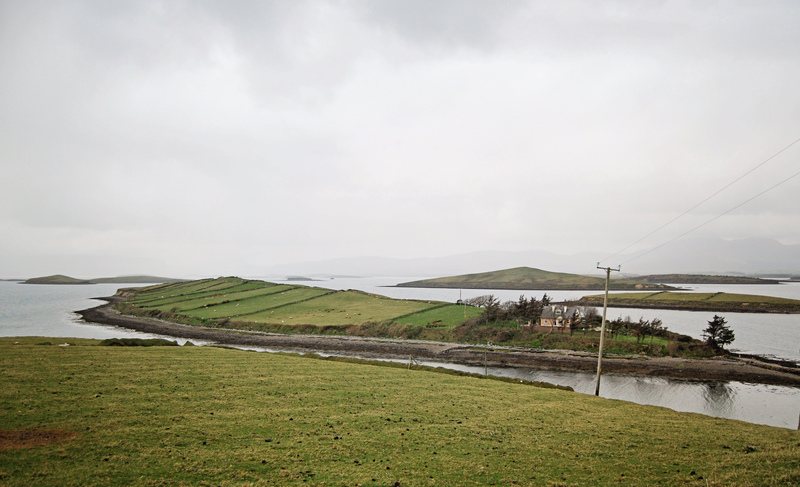 My great-grandmother emigrated from a tiny Island in Ireland’s Clew Bay, called Inishcuttle. When she left for Chicago in 1911 , Inishcuttle held 6 residences . When we visited, there was only one oc cupied residence. Simply locating the exact Island in the Bay wasn’t easy. Few maps even include it, it is so small. Nevertheless, my husband somehow navigated our rental car across two low narrow causeways to the Island. 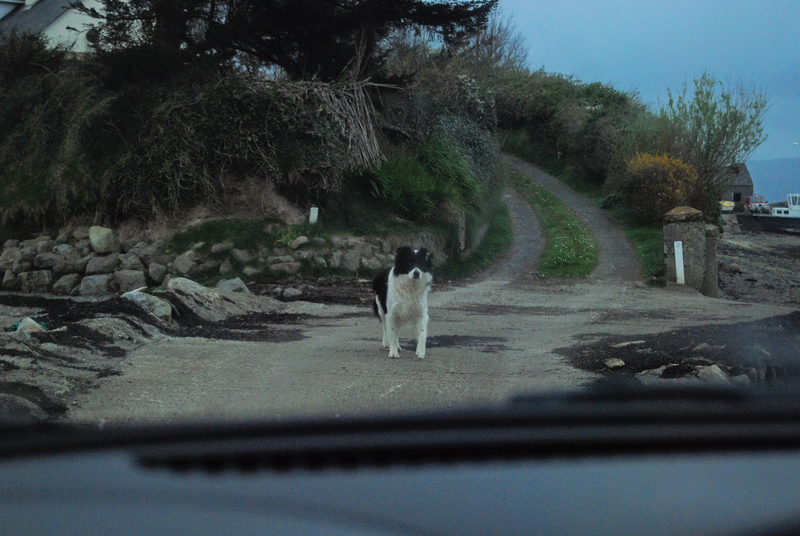 A sheepdog stood between us and the only residence. I nervously got out of the car and found the dog friendly. My naturally introverted-self gathered enough courage to knock on the door of the house, and introduce myself to Mrs. Quinn who came to the door. She explained that her husband grew up on the Island and although he wasn’t home at the moment he would no doubt love to talk to me. I remember asking how far it was to Sligo. My notes and memory fail to recall the Quinn’s exact approximation of distance to Sligo via the cowpaths they told me he ran along, but along today’s roads, Google maps tells me this is some 60 miles . Family lore is full of stories like this one — almost unbelievable, with no way to confirm or deny their veracity. But you know what? It doesn’t always matter whether the story is exactly true or not. I think I will always remember D. Joshua Taylor’s remarks on an episode of Ancestry Roadshow about (I’m paraphrasing) how all family stories, even those distorted by years of exaggeration, all started somewhere for some reason. Often there is at least a kernel of truth in them. The fact is that someone who remembers my 2nd great-grandfather remembers him as a runner. The person who told me this had no idea that I had already completed somewhere around 15 marathons myself by that point. Of course, to me, this piece of information was priceless. Am I ever glad I knocked on that door! 1) More on sports genealogy – Besides my supposed ultra-marathoning 2nd great grandfather, I have some other sports leads I am looking into: Namely, that my great-grandfather played soccer in Chicago shortly after his immigration to the City. I am also hoping to investigate a couple photos I have of my great-grandmother in a baseball uniform. The whole 20th century sports and recreation urban reform movement was in full swing when my ancestors lived and worked in the city. I am currently working my way through a fascinating book on this topic called Windy City Wars by Gerald R. Gems. Also, let’s also not forget the CUBS are in PLAYOFFS!!!! I am happy to say I am multi-generation CUBS fan, rooting for the same team as my North Side Ancestors!!! 2) Today, I had the privilege to attend some of the lectures at the BCG Lecture Series at the Family History Library. I got to hear some of the best in the business for FREE! I love living in Salt Lake!!! Molly Mirhashem, “Why the Boston Marathon is the Best in the World,” Boston Magazine, 14 April 2013 (http://www.bostonmagazine.com/health/blog/2013/04/14/history-boston-marathon-special/ : Accessed 9 Oct 2015). See also, “Boston Marathon: Girls of Wellesley,” Runners World, 1 Oct 2012, (http://www.runnersworld.com/boston-marathon/boston-marathon-girls-of-wellesley : Accessed 9 Oct 2015). See also, Katherine Switzer, “The Real Story of Katherine Switzer’s 1967 Boston Marathon,” Katherine Switzer: Marathon Woman, no date (http://kathrineswitzer.com/about-kathrine/1967-boston-marathon-the-real-story/ : Accessed 9 Oct 2015). 1911 Census of Ireland, Mayo County, District Electoral Division (DED) Kilmeena, Inishcottle, Houses in Inishcottle, Census of Ireland 1901/1911 (http://www.census.nationalarchives.ie/pages/1911/Mayo/Kilmeena/Inishcottle/ : accessed 9 Oct 2015); original manuscript not cited. For date of immigration see, “Passenger Record,” digital images, Statue of Liberty – Ellis Island Foundation (http://ellisisland.org : accessed 19 August 2015), manifest, SS Carmania, 12 April 1911, no page, line 22, Maria O Malley, age 20. My great grandparents were Walter & Alice O,Malley, their daughter Mary Annie nee O’Malley came to Chicago as a teen, they were from Inishcuttle. She married my grandfather John Kelly (I have to look up if her had a brother Michael in Chicago? We still have cousins in the Mayo area. Perhaps we are related? I found your article while researching Inishcuttle, thank you for the photos and information about the Quinn family. Thank you so much for your comment! My 3rd great-grandfather (Patrick’s father) on the O’Malley side was a Walter O’Malley. I believe he had a son named Walter as well. We are almost certainly related! I will take a another look at the records to hopefully determine exactly how! Feel free to shoot me an email at almosthomegs@gmail.com and we can be in touch. The Quinns are wonderful people. I tried to send them a thank you following our trip, but my emails kept getting sent back. I must have had the wrong address. Nevertheless, I wish them only the best! They helped make our trip unforgettable. Residents of a house 4 in Inishcottle (Kilmeena, Mayo) This is where my grandmother was born house 4. House 5 lists a Patrick Malley as head of household, with your great-grandmother Maria at age 21. So they were neighbors and perhaps cousins, but your Patrick and my Walter may have been brothers (or cousins) they were just two-years apart in age? Yes, I have a transcription of a record I found on Roots Ireland of a 02 April 1893 marriage between Walter O’Malley and Alice Nyland in the Westport Civil Parish. Witnesses were Patrick Salmon and Anne Nyland. I believe Patrick and Walter were brothers. Both Patrick’s and Walter’s marriage records list their father as Walter O’Malley/Malley (Sr.). Of course, we would probably want additional evidence to confirm the relationship, but I think its very likely they were brothers!